Santiago Plaza de Armas, courtesy of Paul Lowry via Flickr. Are you are a small business owner or mining industry worker living in a place such as the USA, Europe, Japan, China, or Argentina where the government believes that the secret to prosperity is to print money, accumulating unprecedented debt that cannot be repaid, burdening you and other income earners for at least the next 40 years? Have you considered emigrating to Canada to enjoy their strong economy but are reluctant to suffer the harsh cold climate? Alternatively, imagine living with a responsible government like Hong Kong, in a Mediterranean climate like California. Unfortunately, no such Utopia exists; however, each individual chooses a life based on what he values most and the deficiencies he is willing to tolerate. If you don’t own a business or work in the mining industry, finding a good job with high pay in Chile might be hard; a pizza chef in Canada or other rich country usually enjoys a higher living standard. If you can choose your location and maintain high earnings, Chile deserves consideration. If you have capital and the desire and patience to build a business, Chile is a better than average country although it stills lags competitors such as Singapore and Hong Kong. New Zealand emigrant Rob Woodward successfully started and expanded Woodward Chile; German/Chilean Christoph Flaskamp expanded Chilean beer choices with Tübinger beer; and one of the richest Chileans, supermarket tycoon Horst Paulmann, emigrated from Germany 60 years ago. Downtown Santiago, courtesy of Raul Diaz via Flickr. Access to a large city is essential for earning income in a poor country, and Santiago is the only large city in Chile. While jobs in Chile for Americans are scarce, other than teaching English, many foreigners start their own businesses or possess skills valued by Chilean employers. The best way to describe Santiago is to compare it to San Francisco, the Silicon Valley, and Austin. Santiago is about as dense as San Francisco, so it’s easy to walk to grocery stores, restaurants, bakeries, and other amenities, and there are many examples of stunning architecture in both cities. Santiago underground transportation is efficient and safe and makes it easy to reach the important parts of the city in 20 minutes or less. There is no dense city in the Silicon Valley and the only dense area of Austin is downtown, so people rely on their cars for even the simplest tasks of everyday life and often waste time in traffic jams. San Francisco has Golden Gate Park and Santiago has Parque Metropolitano, both long and useful, while the parks in Austin and Silicon Valley are smaller and disconnected. 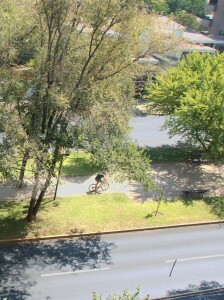 Santiago bicycle path in median strip of a busy street. Santiago is a pretty city with many trees with an extensive system of bike paths on flat land that connect many parts of the city, although the system is incomplete. The steep hills of San Francisco and some parts of Austin are unsuitable for bicycling. Silicon Valley is large and sparsely populated, and there are fewer paths, so bicycles are not as useful as in Santiago. Bicycling is most convenient in Europe, parts of Southern California, and the peninsula between San Francisco and Silicon Valley, especially Foster City. The climate of Santiago is warmer than San Francisco for 9 months of the year, and cooler and drier than Austin in summer. Silicon Valley has an excellent climate that outshines the others. See my climate page for details. 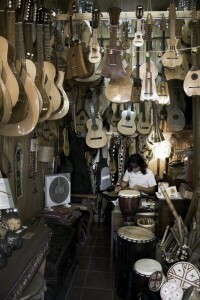 Music for sale in Santiago, courtesy of Steve Evans via Flickr. Health care in Chile surpasses most countries because private industry plays a substantial role; there are no long waits in private hospitals and clinics, as in Canada and Britain, and unlike the USA, the government does not artificially reduce the supply of doctors and increase prices by limiting enrollment in medical schools and internships. The Chilean government taxes private enterprise less than the USA and Europe. The government is raising taxes sharply but consumes 19% of the economy, compared to 45% in the USA and 50% in Germany. One of the most popular books in the USA and Europe is a defense of Marxism for the 21st century. The Chilean peso is a stronger currency than the dollar and euro. The national debt is 6% of GDP, compared to 59% in the USA, 76% in the UK, 63% in Spain, and 50% in Argentina (Source: CIA World Factbook).Santiago is growing while other countries stagnate. The IPSA index of Chilean stocks triped in the 2004-11 period although it has declined in 2012-13. 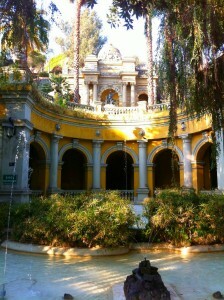 Cerro Santa Lucia is an attractive park in the Bellas Artes neighborhood. Photo courtesy of McKay Savage via Flickr. Chile has recorded 17% passenger growth for the second consecutive year, making it the fastest growing market in Latin America. The rapid growth in Chile is somewhat surprising as it is one of the more mature markets in Latin America and the market is dominated by one player, LAN, which can have a stifling impact on competition. But the small country of 17 million continues to support rapid increases in travel propensity, which is already the highest in Latin America, driven by a strong economy and Chile’s unusual geography. After recording flat traffic figures for 2009, Chile’s aviation market has grown by 57% over the last three years to 15.2 million passengers, according to Chilean Civil Aeronautics Board data. Real estate has rocketed in recent years, the government created a commission to determine whether it’s an investment bubble, and the New York Times says Santiago real estate booms because the City Is So Charming That Many Visitors Never Leave. 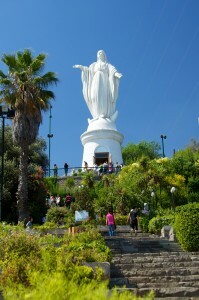 Cerro San Cristóbal is the most popular tourist attraction in Santiago. Locals hike and bike to the summit on weekends. Photo courtesy of McKay Savage via Flickr. Voucher education in Chile offers the best choices of any country, a successful laboratory studied by researchers around the world; however, a strong socialist movement organized a strike of students and teachers in Chile that threatens the Chile economic model. The poverty rate declined from 45 percent in 1986 to 15 percent in 2009 but that is insufficient according to Chilean socialists. If you are accustomed to living in the USA or other socialist country, you might be appalled at capitalism in Chile. For example, one young woman recently expressed shock and anger that she pays more for medical insurance in Chile than young men even though her policy does not cover pregnancy. Insurance companies charge more because young women use more medical services even when they avoid pregnancy. In contrast, under the Affordable Care Act (ObamaCare), young men and women pay the same price as mandated by the government; and women past menopause and men are required to pay for pregnancy coverage that they can never use. Immigration to Chile has tripled in 7 years, from 60,280 in 2006 to 158,128 in 2013. Migrants have mainly come from Latin America and Spain and is likely to increase since Spaniards and Argentines are burdened with enormous government debt. John Cobin, author of the best blog in Chile, provides a list of 55 reasons why you should emigrate to Santiago in Is the Grass Really Greener on the Other Side? Chile offers a combination of pleasant climate and fewer government burdens than many others. If you’re ready to shed the debt your government has imposed upon you, it is a good destination to consider. There are substantial downsides to Santiago such as winter air pollution and government harassment of foreigners described in Why You Should NOT Move to Santiago, Chile. There are also more reasons to move to Chile. Panama is another good country to move to. 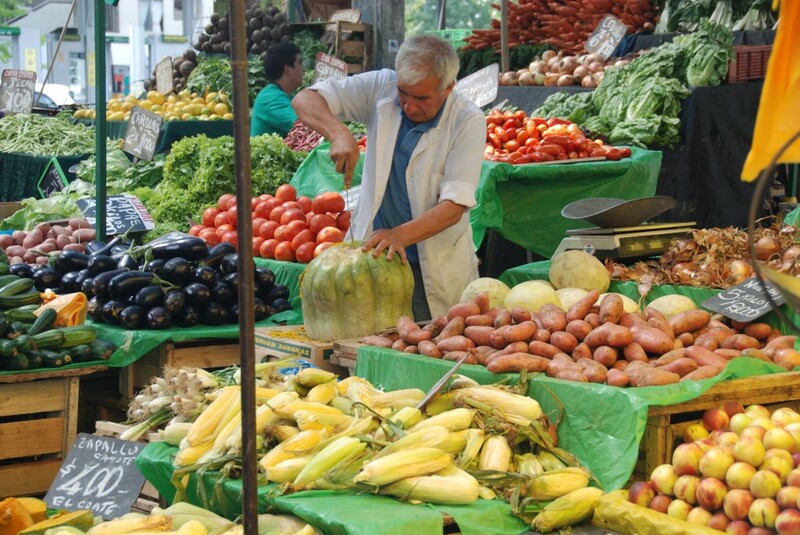 Will Spain Emulate the Chilean Economic Model? via Move to Chile | Moving to Chile | Best places to relocate | Brophy World.